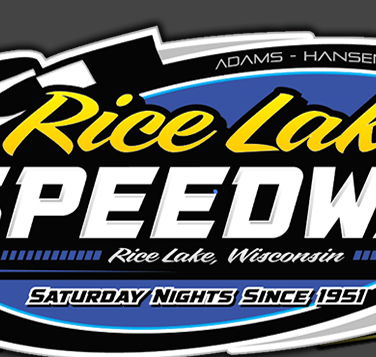 RICE LAKE, WI (May 10) – Kevin Burdick took advantage of a flat tire by leader Curt Myers and made a late race charge to earn his first ever feature win and highlight the racing program Saturday at the Rice Lake Speedway. Jason Havel and Mike Truscott became the first multiple winners of the 2014 racing season while Sam Fankhauser won his first main event of the season. The last program on the schedule, the modified feature, fell victim to a rain shower and will be made up next Saturday night. Nick Oreskovich took the early lead in the super stock main event but was soon challenged by Myers for the lead. Curt worked both high and low on Oreskovich and was finally able to edge past him down the back chute to take over the top spot. However, Oreskovich didn’t give up and when Myers got too high in turn two, Nick pulled back beside Myers in a battle for the lead once again. As the top two slugged in out for the lead, Willie Johnsen Jr, Bart Steffen, Jason Forehand and Burdick were battling for position. Myers was able to edge back into the top spot but just one lap after the halfway signal from starter Troy Holder, Myers suddenly slowed on the back chute, triggering a yellow with a deflated right rear tire. Curt opted to call it a night at this point and Oreskovich inherited the lead. However, he was challenged by Steffen for the lead until Burdick moved up the track and started edging in on the top two. He continued his high side charge and down the front chute, was able to drive past Oreskovich and take over the lead. Forehand was also making a charge as he too moved up the track and in the last couple of laps also passed Oreskovich. However, Burdick had built up a nice lead and the Proctor MN driver drove home for his first ever win at Rice Lake. Scott Lawrence came from sixteenth to complete the top five. Havel wasted little time getting to the front of the pure stock field and earning his second win at the speedway this year. Bob Thompson out battled Randy Graham to take the early lead but Havel and C.J. Wagner were soon challenging for the lead. When Thompson slid up the track, Wagner was right there to take over the lead with Havel following him into second. Havel worked hard on Wagner and when C. J. gave him an opening on the inside of turn four, Havel dove for the spot and took over the lead. Wagner refused to yield and stayed within a couple car lengths of the leader. On the last lap, Wagner took a big charge to try and slip under Havel but he couldn’t quite pull it off and settled for the runner up slot. John Erickson had a solid run to finish third while Hunter VanGilder came from fourteenth to fourth with Joel Hinrichs trailing. Truscott won his second Midwest modified feature of the year as he caught a break when the two leaders tangled and Truscott was able to slip past both of them. Nick Koehler took the early lead in the main and was the man to beat from the beginning. However, Tito Viltz came in to challenge him, trying a few times to drive past the outside of Koehler but not quite able to pull off the move. As they continued to battle for the lead, Kevin Eder and Paul Suzik were also fighting for position. Truscott made some clever moves to get through traffic as he raced up from the fourth row and put himself into the third position and challenging. Viltz moved to the second lane and he was able to creep up beside Koehler in the battle for the lead. Just as Tito made the pass, the lone yellow of the event waved for debris on the track. This set up a four lap sprint to the finish and the ending was wild. Again Viltz was able to pull beside the leader down the back chute, this time on the inside. They dove hard into turn three and they got together which upset and slowed both cars. Truscott took advantage of the situation to fly by both drivers on the high side and take over the lead. The previous leaders got going again but there was only a couple laps left and Truscott drove on for the win. Viltz regained his pace but settled for second with Koehler right behind him. Eder and Suzik had battled most of the race and Eder edged past his northern rival at the line for fourth. The street stock feature saw a similar situation occur as in the Midwest modified main and Fankhauser was the beneficiary with his first win of the year. Second year driver Troy Chaplin led the majority of the feature race as he sought his first ever win. After getting by Bob Wahlstrom on the first lap, Chaplin led Kolby Kiehl and Cody Kummer in the early going. Adam Soltis and Josh Amans moved in to challenge while Fankhauser and Scott Clark were also on the move. Fankhauser moved to the outside and started to advance with Clark also making strong advances. Fankhauser drove past Soltis and then closed on Chaplin as the laps started to run down with Clark following into third. Sam pulled up beside Chaplin and just made the pass when the yellow flag flew for a spin. Chaplin regained the lead for the restart with only four laps to go with Fankhauser and Clark behind. Again Sam went to the high side and started to work up beside Chaplin. Going down the back chute Fankhauser pulled beside Chaplin when Clark suddenly bolted to the low side and the leaders went three wide into turn three. Clark and Chaplin made some contact and both struggled to maintain control. Fankhauser blew past both of them on the high side to come out of the corner as the leader. The yellow flew for debris with Clark’s door ripped off, but the lap was scored complete and Sam was the new leader. The two lap sprint to the finish saw Fankhauser pull away while Chaplin was able to hold off Clark for second. Soltis finished fourth ahead of a fast closing Ron Hanestad. The modifieds took to the track for their main event but a spin on the first lap caused the yellow and at this point the rains started to fall. With the intensity of the rain picking up, the cars quickly scattered back to the pit area and the program was called complete. The modifieds will make up their main event next Saturday. 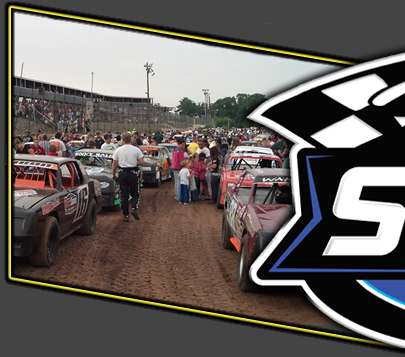 Next Saturday, May 17, there will be another complete show in all five classes plus the makeup feature race in the modifieds. 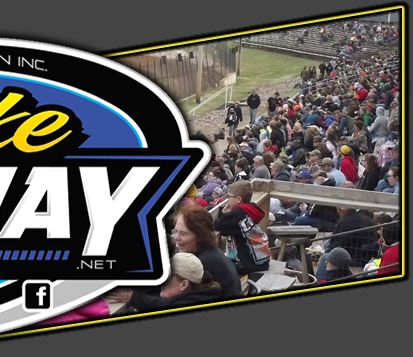 On May 24, another five class program will be held plus the UMSS winged and traditional non winged sprints will both be in action for a big holiday program. Hot laps start at 6:30 p.m. both nights.